After filming his welcome to the team BSD edit, travelling for a month to be part of the first BSD dvd (Any which way) and being sent again in Scotland for another BSD project, guess what ? 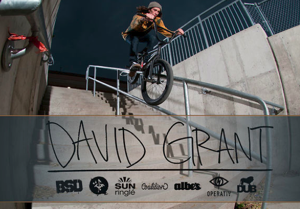 David Grant is still hungry ! In a pretty insane edit for the Chicago based agitated Gully Factory Bmx Crew (, made out of footages here and there you’ll see a mental rider apparently ready to do a whole lot of things for a good grind. Don’t try this at home !